Is it possible to add a digital signature to a JotForm? I have an employment application template set up and it requires the applicant's signature at the end because they have to agree to a background check and drug test. There is no electronic signature feature. What I have seen done is to have a required checkbox that says "I accept the terms" or a small textbox where they are asked to enter their initials. Another possible solution is to add a "Print Form" button to your form and then ask them to print, sign and fax the filled form. 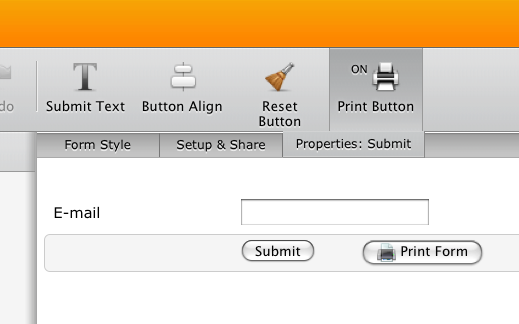 You can enable print form button by clicking on the Submit button and then selecting "Print Button" at the toolbar. I was just researching about this topic. So, I was wondering if you had any digital signature example or digital signature vendor you had in mind? Hi, i came across this. I want to use this form builder to create member agreements. We require a signature to compare to scanned ID's. We use this multiple times a day. iformbuilder.com does this, but does not have the clean look look like jotform. This is a very necessary step for us. Is there a way to create this with jotform? UPDATE: We have just released e-signature capturing for forms.